Don’t let the size fool you. 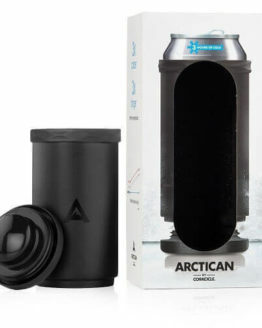 More than just a fan that recycles the air, this portable miniature air conditioner packs a powerful cool punch that not only cools the person or object directly in front of it but it’s robust enough to cool the air too. Simply soak the cooling filter with water and turn it on. The humidifying effect of this cooler also helps alleviate breathing problems from dry air and moisturizes the skin. It has a sleek, ergonomic design with USB power for office desktop use and battery power for the ride home from work and beyond. Your mom’s body temperature will thank you. This little iEGrow Handheld USB Mini Misting Fan is so nice. It is a little over 7″ long, 3 1/2″ wide and 2+” deep. It is easy to hold because of the nice size hand hole that is built into it. 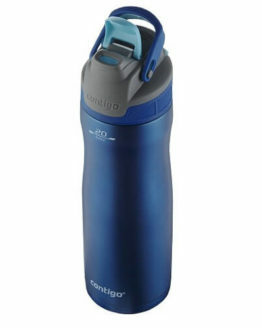 The 9 ounce weight keeps this fan very lightweight…even when you add the water. I love the looks and feel of it. I believe it will last for many hot summers. 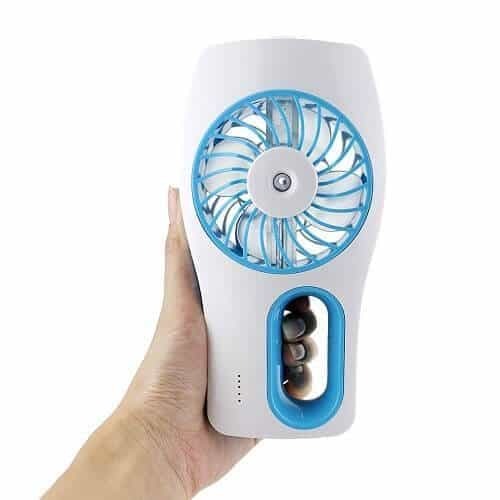 This is a great little fan to have with you anywhere. Works great on a desk, bedside or as a handheld fan when outdoors. I imagine it would be great to have at an event or amusement park when being outside for long periods in the heat. The mist is an especially nice touch in that case. 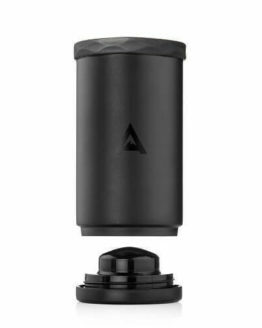 With three different modes, fan, mist, or both, you can use it however you like. 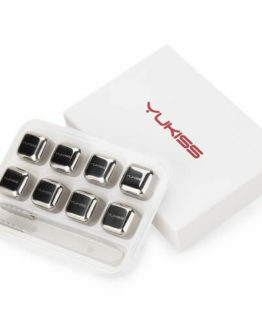 It is made of nice strong plastic and feels really well made and is super easy to use. This is a nice little personal fan – it has a much more elegant style than most handheld fans. 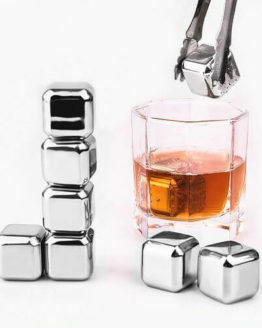 It stands upright by itself, so you can use it on a desk or table, but then you can pick it up and carry it around with you. It has the added feature of a small water tank so you can create a misting effect while you are using it. On mine this is the least effect feature – it barely works so you can hardly feel it – but that’s okay, I live in a humid climate so more moisture isn’t exactly desirable. I love that it’s USB rechargeable so I don’t have to worry about batteries or cords. Overall, this is a great way to keep cool in the summer. The addition of the water mist makes a big difference in the cooling power. There are a few improvements that could be made in the overall design but this remains a handy summer item. 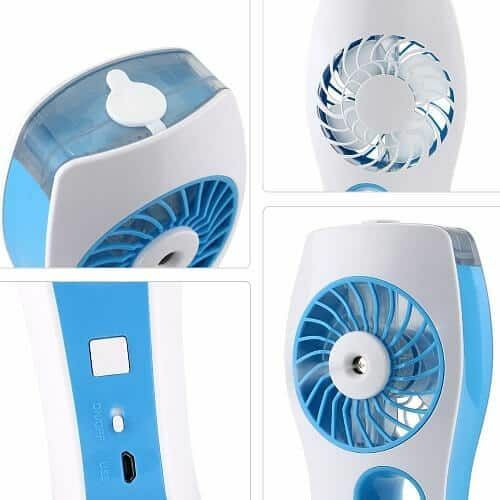 This takes the personal fan concept a step further by adding in a fine water mist. 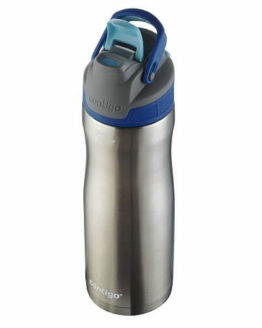 There’s a small water container at the top that you fill with water (using distilled water is highly recommended). 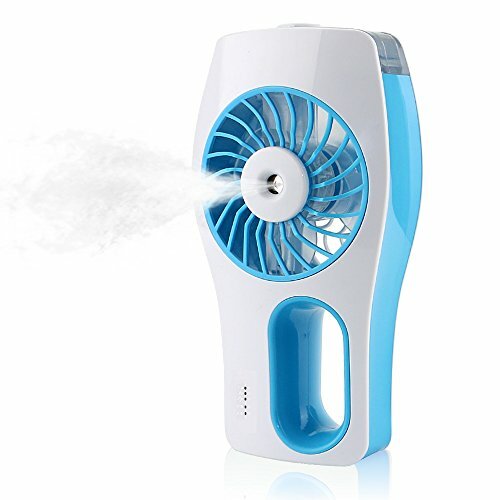 You can then use it as a regular fan, as a mist-only device, or as a combo fan plus mist. Selection is done via the mode push button switch. The mist is very fine – it’s very much the consistency of what you see coming out of a ultrasonic humidifier. 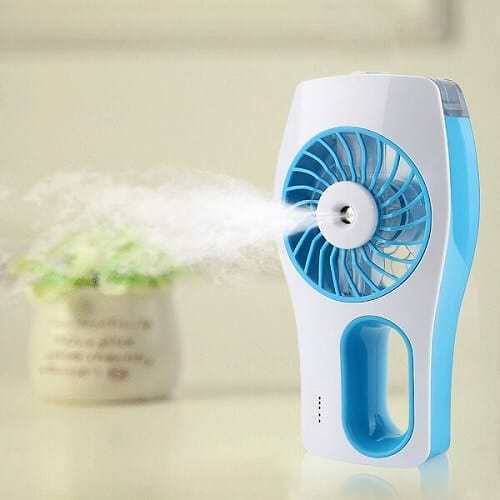 There’s no water “drops” per se, but rather a fine mist that extends out about a foot from the fan face. The misting function makes a little noise, but, as with the overall fan noise, it’s very muted and not at all objectionable. The build quality feels pretty good. It’s all plastic, but has a solid feel. It has an internal battery that is recharged via a USB cable. I have it in blue, and the baby blue and white color scheme looks great. It also comes packed in a nice quality box to give it more of an upscale feel than I’ve normally seen with personal fans. It stands upright on a flat base if you want to use it hands-free on a desk. However, the fan can’t be tilted. It would have been great to have a kickstand of some type so the fan could be leaned back and the air flow directed upward rather than just forward. There is a handle to help hold it by hand, but the cutout for the grip is too small – I can only fit two fingers through it. It needs to be larger and perhaps have a lanyard as well.